From today, British Airways is offering customers even more ways to spend their Avios, by giving them the opportunity to use Avios to select their seats. Now, customers will also have the option to choose to use Avios to reduce the cost of seat selection, or to cover the cost in full. Customers who do not have access to free seat selection, and do not wish to pay, will continue to be able to select their seat for free when check-in opens 24-hours before departure*. British Airways already offers free seat selection for Gold and Silver members of the British Airways Executive Club from the time they book, and also offers free seat selection for Bronze members seven days before their flight departs. The move, therefore, will be of the biggest benefit to Blue members who can now choose to use their Avios, instead of cash, to select their seat. The opportunity to fully cover the cost of selecting seats, or cover part of the cost, using Avios, is available on all British Airways operated flights and can be actioned through Manage My Booking on ba.com or through the contact centre**. Customers who do not wish to spend Avios but do want to select their seats, will still be able to pay the cash amount. *All customers (with the exception of those travelling on Basic fares) will continue to be able to select their seats for free at online check-in, which opens 24 hours before departure, and at the airport. Those customers travelling on Basic fares will continue to be allocated a seat at check in. As per policy, we’ll continue to do our best to seat families together a few days before their flight departs. Seats may be split across aisles or rows. However, children under 12 will always be seated with an adult on the same booking. More information can be found here. There will continue to be no charge for reserving a seat if a customer has a specific seating requirement because of their disability. More information can be found here. **Full terms and conditions can be seen here. 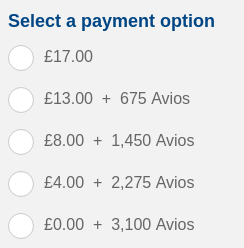 The option to pay to select seats using Avios is available regardless of fare type. highpeaklad, PETER01, hugolover and 4 others like this. Sounds like a good move. I wonder what the exchange rate will be? mike&co and TheJayHatch like this. No indication on how many are needed? I am in favour iof BA doing this (as I have posted in the other threads) but the number of avios needed is rather crucial. Doesn’t seem to be live yet, just tried and cash only. I just checked as well. I have 2 flights coming up. One in WT+ and one in Club World, and cash only as of now. I've just checked this as I have a flight for 4 in Club LAS-LHR in June. If I select four seats in the lower deck at a cost of £85 each and click through to the payment page I get the option to pay using Avois in full or in part payment. All 4 seats will cost 61800 Avios in total. 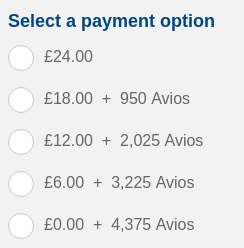 At today's Avios purchase rate (50% bonus expiries today) that would cost £655 to purchase 40k Avios plus the 20k bonus. The same 0.55p per point they use for all other redemptions eg wine. EuropeanPete and hugolover like this. Hi BA Executive Club is there a chance we might see someone active on the board again ? T8191, wrp96, Gshumway and 1 others like this. Wow ! That’s a big chunk of Avios. Even in the current Buy Avios offer - with a 50% bonus - 36K Avios would cost very close to £400. Useless then! You only see the avios if you express an interest in paying? Most people won't click through. hugolover and florens like this.